Driving down Route 30, you’ll find this little slice of Pennsylvania Dutch heaven just west of Paradise. Before hotels, outlet centers and tourist attractions popped up along the historic highway, it was once home to Enos Miller’s truck repair shop. As the story goes, Anna Miller, Enos’s wife, would serve homemade chicken and waffles to drivers while her husband fixed their trucks. Truth be told, the Millers found that they could make more money fixing food than repairing rigs. So, the couple opened a small diner in 1929 that has grown to become one of Lancaster’s most popular restaurants. The term Pennsylvania Dutch is derived from the settlers who initially came from German-speaking areas of Europe in the 18th and 19th centuries and spoke a German dialect they referred to as “Deitsch” or “Deutsch”. Over the years, it became misinterpreted as Dutch. 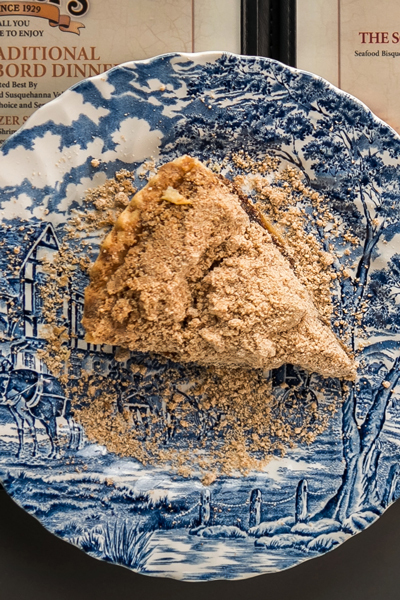 As in most regions of the country, families have passed down recipes from generation to generation, which is why Pennsylvania Dutch country has its traditional sayings, styles and, of course, cuisine. Ronks, where Miller’s and its associated stores – The Quilt Shop at Miller’s, Gift and Bake Shop, Mount Hope Estate Winery & Gift Shop, and more – are located, is a quaint farming community less than 10 miles from Lancaster City. Known for its Amish and Mennonite population, the area is a popular tourist destination. When customers arrive at Miller’s, they are greeted by a 1927 Graham Brothers Huckster, which has been transformed to a hostess podium. Old black and white mural-sized photos dating back to an era that saw Prohibition, the Great Depression and the beginnings of World War II, cover nearly every wall in the facility; most are local photographs that have been chosen and printed from either LancasterHistory.org or restaurant archives. The entire restaurant saw a complete overhaul in 2011, changing the décor to provide an environment of what life in Lancaster was like during the 1920s. “I was going for permanence. I was throwing back to what it was like in 1929,” says Bill Moshos, Miller’s director of marketing. In addition to the life-sized murals, Miller’s also added an exhibition island in the center of the dining area and enabled à la carte menu dining to be offered as well as the smorgasbord. “We went back to our roots,” says Miller’s Executive Chef and Bakery Manager Steve Gainer, who not only has spent the past 20 years working for the Thomas E. Strauss company, but he is also a native of Lancaster County, born and raised in Lititz. Steve, who with his wife, Sally, once operated his own restaurant, says he’s always had an understanding of food and a desire to cook. Both of his parents were no strangers to the kitchen. “My mom is a fantastic culinary person, and my dad was really into cooking. It’s just something I’ve always been around,” he notes. And, speaking of food … There’s so much of it! “Ninety percent of the stuff that you’re going to see here is made from scratch. Seven days a week, we cook for the day, every day,” Steve explains. Noticing that “atmosphere and customer comfort are important,” as well, Miller’s reduced the number of seats to the upper 300s to allow customers more space. It’s not just the amount of food that’s being offered, but the quality of the food being served at Miller’s sets them apart from most buffet-style eateries. Steve mentions two local farmers – Stephen Beiler and Elmer Fisher – who provide him with the freshest of produce, including corn, tomatoes, zucchini, cabbage, watermelon, cantaloupe and broccoli, just to name a few. The menu is part Pennsylvania Dutch and part American fare. Steve considers their signature items to be shoofly pie, seafood bisque, chocolate pecan pie, gourmet apple pie, chicken pot pie, hot bacon dressing, baked cabbage and, of course, chicken & waffles. “Did I say chicken & waffles? I’d probably be shot if I didn’t say chicken & waffles,” Steve laughs. 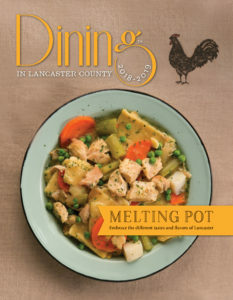 He adds that chicken pot pie – Lancaster-style – confuses visitors from other areas of the country. “They often ask, ‘Where’s the crust?’” he confirms. But, if you’re not in the mood for some Pennsylvania Dutch comfort food, Miller’s also offers other steaming hot alternatives, such as beef burgundy, vegetarian chili and steamed shrimp. 2811 Lincoln Highway East, Ronks. Hours of operation: Open daily, 11:30 a.m.-8 p.m.
Call-ahead seating (717-687-8436) and reservations are available.